Three shutouts and one one-run game opened the ENEOS Presents Women’s Baseball World Cup. 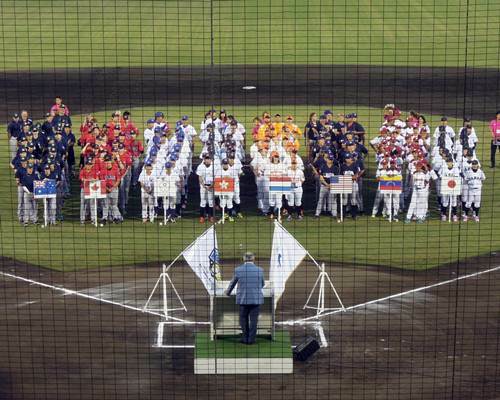 MIYAZAKI, Japan – The three National Teams from the Americas – Canada, United States and Venezuela – and the host country, Japan, opened the ENEOS Presents VI IBAF Women’s Baseball World Cup, under the WBSC, with victories at Sun Marine and Ivy stadiums. To open the women’s baseball world championship, Canada no-hit European representative Netherlands, en route to a five inning, 11-0, victory. Heidi Northcott and Cindy Saavedra combined for the no-hit victory, striking out eight Europeans. Canada collected thirteen hits, which were sprinkled by nine of Canada’s players. Canada first baseman Kate Posta picked up two hits in the opening inning and drove home a total of four RBI. Venezuela overcame a 4-1 deficit, adding a run in the bottom of the final inning (7th) to defeat Hong Kong, 5-4. Hong Kong capitalized on three Venezuela errors to put all four of their runs on the scoreboard in the third inning. Alva Segovia had two hits and two RBI for Venezuela, while pitchers Kerly Perez and Day Cazorla only allowed one hit in the final four innings to help Venezuela open with a win. The United States used eight hits and nine runs, while 17-year-old Sarah Hudek allowed just one hit over five shutout innings, as the United States collected the Americas' third victory of the day, with a 9-0 win over Chinese Taipei. USA first baseman Malaika Underwood was a perfect 2-for-2 with an RBI and three runs scored, while left fielder Tamara Holmes went 2-for-3 with 2 RBI, helping to power the USA offense. Japan’s offense went 9-for-21 (.429) to open against Australia, which ended the game, 14-0, before a crowd of 8,500 fans and a nationally televised audience. Australia threatened to score to start the game, when third baseman Christina Kreppold blasted a moonbeam to the right field fence for a double. 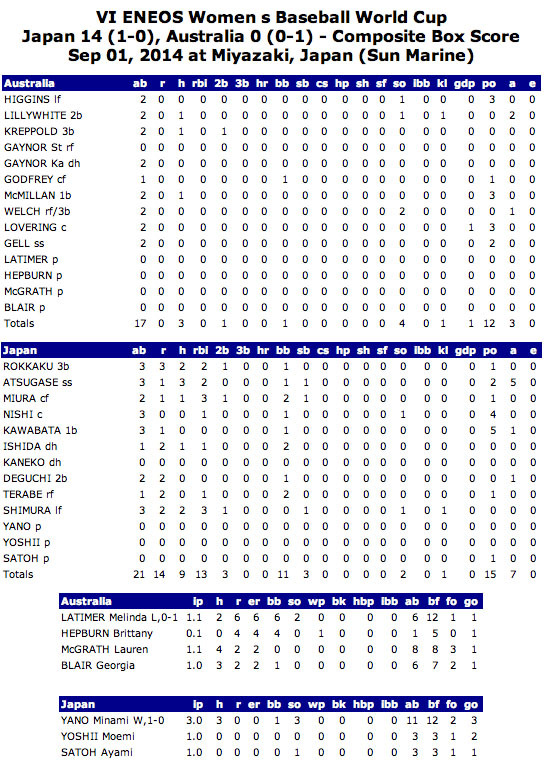 Japan’s trio of pitchers only allowed three hits and one walk, while Australia’s pitching staff issued 11 walks in 4.5 innings. Japan’s shortstop Miki Atsugase went 3-for-3 with 2 RBI, while being involved on a game-leading seven outs on defense. Japan’s win streak in World Cup action extends to eight games, dating to 2012.